President Mnangagwa’s administration is making headway in taking Zimbabwe onto the global arena, with the President this week expected to receive a special envoy from British Prime Minister Theresa May to discuss issues of mutual interest between the two countries. The discussions will touch on several economic issues, including Zimbabwe’s possible return to the Commonwealth. It will be the third time President Mnangagwa is hosting a British envoy in less than three months, signalling London’s seriousness to thaw frosty relations with Harare. The first was British Minister for Africa Rory Stewart who met President Mnangagwa a few hours after his inauguration on November 24, last year. He was followed by Sir Simon Gerard McDonald who is Permanent Under-Secretary at the Foreign and Commonwealth Office and Head of the Diplomatic Service. The engagements are in line with President Mnangagwa’s sentiments in his inaugural speech that Zimbabwe was charting a new path that embraces all countries of the world. This, President Mnangagwa said, would allow Zimbabwe to catch up with other countries in terms of economic development. Addressing journalists yesterday after landing at Robert Gabriel Mugabe International Airport from his African Union engagements in Addis Ababa, Ethiopia, and, before that, the World Economic Forum (WEF) in Davos, Switzerland, President Mnangagwa reiterated that Zimbabwe was open for business for both local and global investors. The British envoy is coming in the wake of another confirmed high-profile visit to Harare by Russian Foreign Minister Sergei Lavrov to cement bilateral relations between Harare and Moscow. Minister Lavrov’s visit was confirmed by Russian acting ambassador to Zimbabwe Mr Dmitry Korepanov after he met Cde Simon Khaya Moyo last week when the latter was the acting Minister of Foreign Affairs and International Trade. 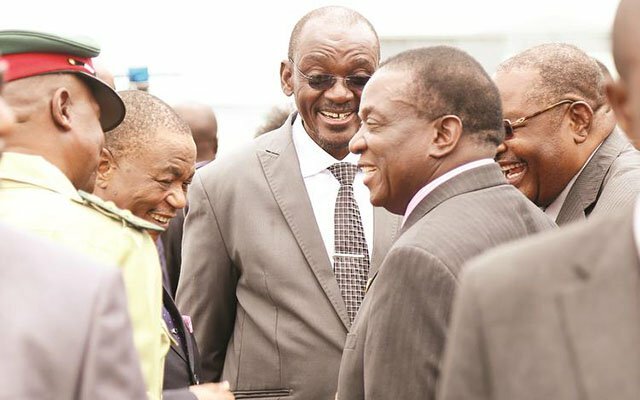 President Mnangagwa, who was making his maiden appearance at both the WEF and the AU in his capacity as Head of State and Government, said his engagements were “exceedingly successful”. In Davos, President Mnangagwa said many stakeholders at the forum were keen to meet his delegation, but they only managed to engage those key to Zimbabwe’s current economic situation. “We were well received,” he said. President Mnangagwa said in Ethiopia he met a group of Zimbabwean professionals who expressed their willingness to come back home and exploit opportunities presented by the new dispensation. “The group that (we) addressed in Addis Ababa from Zimbabwe was a smallish group of persons but they are enthusiastic about coming home and making a contribution. Most of them (are) professionals, not business people,” he said.